To start this Over 40 Ab review, I have a question for you. Do you think this product is a scam or is it legit? For me, it is a scam and this review, I will tell you why. Created back in 2015, Over 40 Ab prides itself on helping you lose and shrink your fat cells in just 12 minutes. That itself doesn’t sound right to me. Seriously? In just 12 minutes? It says that there is a secret twelve minute trick that will help you enhance your metabolic rate and reactivate your dying fat-burning hormones. It promises that both gents and ladies will achieve a tighter tummy in just 7 days. Yes, it is only for people 40 years old and above. Hmmm.. Intriguing right. Now, let’s go ahead and talk about the author. Well, this dude claims that he is a fat loss and nutrition expert though he never mentioned how he is qualified for such. All he says is that he was a first runner up on Body for Life in 1998 which came up negative as I tried to verify it. He also claims that he was once featured in Amazon, New York Times and other fancy channels but again, no proof. Go ahead, feel free. Check it out for yourself. Furthermore, he claims that Karen, his wife, ran a world class training studio in Michigan for 5 years but the name of the studio was never mentioned thus we cannot verify the truth behind it. Shaun also showed some documents to prove that he was features in different stations and even in New York Times. What is the story behind the Over 40 Ab Solution? Shaun talks about the struggles of his wife Karen as she was diagnosed with colorectal cancer. Since she needed to undergo chemotherapy and radiotherapy, her belly started to bulge. After trying and failing on different diets and exercises, Shaun allegedly found the missing piece for people above 40. Karen used the said routine and after 10 weeks, she lost 22 pounds and looked younger. Shaun provided a detailed photo of his wife to validate his claim. Guess what? The photo also appeared on 2 other weight loss programs! 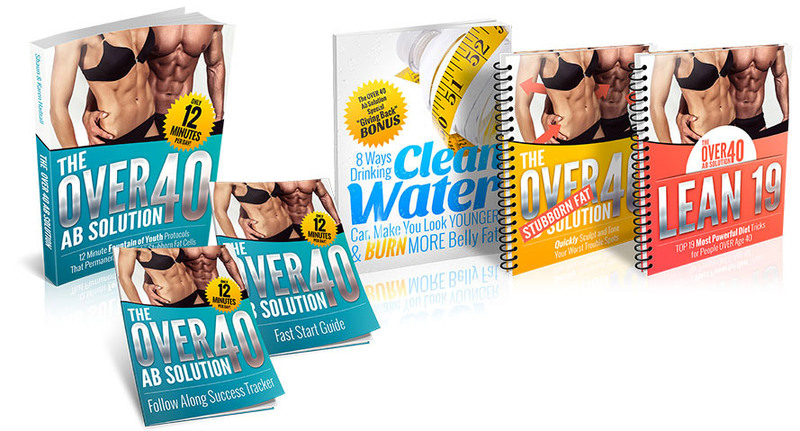 These programs were 14 day rapid fat loss plan the 4 cycle solution, both were also scams. Okay. Let us move to the product now. What is the Over 40 Ab solution About? Based on their website, Over 40 Solution is the only zone training for people above 40 years old. It claims that you will be able to achieve a younger looking you by going through 3 different zones. Primer 1: kills your body’s fat storage hormones so you can eliminate your unwanted fat cells. All hormones on this zone were not named by Shaun. This zone aims to activate your ‘fountain of youth’. It consists of 3 movements. Movement 3: 60 second workout that will eliminate the unwanted energy from your body. Flushes out your belly fat and making it flatter in just 12 minutes. It consists of 3 secrets. First off, he talks about Big Pharma and how they generate a lot of revenue from the products they sell. This part will take several minutes of the video. Next, he says that your genes is not to be blamed for your weight problems. Then a pop up shows up asking you to stay on the page. All testimonies were from Shaun’s previous product. Nothing new. Well, Shaun has something to say about that. Well, to add on the things mentioned above, Over 40 Ab Solution also uses an extreme way of pricing. Why did I say so? So go ahead and visit the website at http://www.over40absolution.com and you will see on the bottom part of the page a timer which says you only have 15 minutes to decide if you want to purchase the product for only $29. Then once the time is up, you’ll have to pay $89!!! But, if you will click on back or try to relaunch the page, the same promotion shows up. So you get another 15 minutes. No legitimate website will do that! Plus they will also bill you for $7 a month for another product, the “Get Lean in 12 Club”. That part was not mentioned on the page. So if this Over 40 Ab Solution Review is not enough for you, I don’t know what else to say but I simply don’t recommend this product as it is a SCAM! !